The moment you’ve all been waiting for is finally here — the first eighth grade bake sale! Buy yummy sweets — everything’s $1 — as part of Coffee Corner. The magic happens before school on Friday, Sept. 7. Please sign up for a time on Dr. A’s music room door. The sign up sheet is located on the north door which is across from the school office. Rehearsals begin Monday, Sept. 10th at 3:30 and will be every Monday and Tuesday, except holidays, from 3:30 to 5:30. Rehearsals in Jan. will be every weekday at the same time: 3:30 to 5:30. Performances will be Jan. 25, 26, and 27. A weekly posting of the rehearsals, and which parts will be rehearsing, will be posted on my door and posted electronically. Come get something yummy and cold after school on August 24. It’s the first Frozen Friday of the year! Eighth grade is selling icy treats for just $1. The Class of 2019 is holding its first restaurant fundraiser on Tuesday, August 28, from 4:00 – 8:00 p.m., at Chipotle, 6501 E. Grant Road #141 (the one across from Target). All you need to do is eat – the more you eat, the more we earn! Make sure to mention you’re there for St. Michael’s. You must order and pay in the restaurant for St. Michael’s to earn money — no online orders. Because we did such a wonderful job in our Math-A-Thon, there will be a relaxed dress day this Friday, March 9th. There will also be an Eegee’s party in front of the office after school. Make sure your students come by and get a free frozen treat! Great job on this fundraiser! We are excited about Love of Reading Week which begins on Monday, March 5th. Our theme this year is Paws for Books. We have some very interesting authors scheduled to talk to our students. The kick-off for Love of Reading will begin with our Monday Chapel. We will be having some special visitors who will help us kick-off Paws for Books! All classes will welcome parent readers who might wish to share a special book or poem with their child’s class. Please make arrangements with your student’s classroom teacher. Book boxes will be found outside your child’s classroom where we will be collecting gently used boxes for the “Angel Heart Pajama Project,” a 501c3 non-profit organization that provides books to children in need. These children are homeless, abused, abandoned, in shelters and foster care. It’s a wonderful opportunity to look through your child’s book shelves and find books they no longer read or have grown too old for to donate to this organization. The Lower School will have a pajama day on Friday, when they will be doing a lot of special reading and enjoying juice and cookies together. The Intermediate and Middle School will also have special reading activities going on throughout the week. Here is information about the authors that will be visiting during the week. Diana Ossana will speak to the 6th through 8th grades on Tuesday, March 6, from 10:30 to 11:15 a.m. in the Student Center. Paul Mosier will speak to the 4th and 5th grades on Friday, March 9, from 10:30 to 11:15 a.m. in Tankersley Hall. Learning A to Z will speak to the K through 3rd grades on Wednesday, March 7, from 8:00 to 8:35 a.m. in Tankersley Hall. According to Wikipedia, Diana Ossana is an American writer and producer who has collaborated on writing screenplays, teleplays, and novels with author Larry McMurtry since they first worked together in 1992 on the semi-fictionalized biography Pretty Boy Floyd. She won a Best Adapted Screenplay Oscar or Academy Award, a Writers’ Guild of America Award, a BAFTA Award and a Golden Globe Award for her and McMurtry’s screenplay of Ang Lee‘s Brokeback Mountain, adapted from the short story of the same name by Annie Proulx. She is a published author in her own right of several short stories and essays. Diana Ossana will speak to Grades 6-8 on Tuesday, March 6. According to HarperCollins, Paul Mosier began writing novels in 2011, but has written in some fashion his entire life. He lives a short walk from the place of his birth in downtown Phoenix, Arizona, but it has been a very circuitous route that brought him there. He is married and is father to two lovely daughters who both read fanatically. He loves listening to baseball on the radio, eating vegetarian food, drinking coffee, and talking nonstop. His middle-grade debut novel, “Train I Ride,” has earned starred reviews from Publishers Weekly, Booklist and Kirkus, is a Junior Library Guild Selection and earned him a Publishers Weekly “Flying Start” designation. It’s about a girl who turns 13 while riding a train from Los Angeles to Chicago, and who has nobody in the world but the strangers she meets on the train. His second middle-grade novel from HarperCollins, “Echo’s Sister,” will be released August 7, 2018. A third novel from HarperCollins- “Summer and July”- is scheduled for release in summer 2019. If you are interested in purchasing a copy of “Train I Ride” and having Paul Mosier autograph it, please let Mrs. Faltico know ahead of time and Mr. Mosier will bring copies available for purchase following his presentation to grades 4-5 on Friday, March 9 ($12 each, hardcover). For additional information about Paul Mosier and “Train I Ride,” visit https://novelistpaulmosier.wordpress.com. Learning A-Z: Learning A-Z is a leading innovative education technology company that provides educators, administrators, students and parents with affordable resources to support and develop literacy and dual-language and bilingual programs through a blend of printable, projectable, digital, and mobile platform resources. John Morgan, Arnulfo Bermudez, and Lee Blahnik will speak to our K-3 students on Wednesday, March 7, about education technology and the process of making, editing and illustrating a book. For additional information about Learning A-Z and its products go to www.learninga-z.com. Come hungry to STEM Night! The eighth graders will be selling a selection of dinner options: fried rice bowl (with spring roll), pizza, tamale plate (with rice and beans), and dessert. The eighth grade fundraisers help pay for their class gift and graduation night. 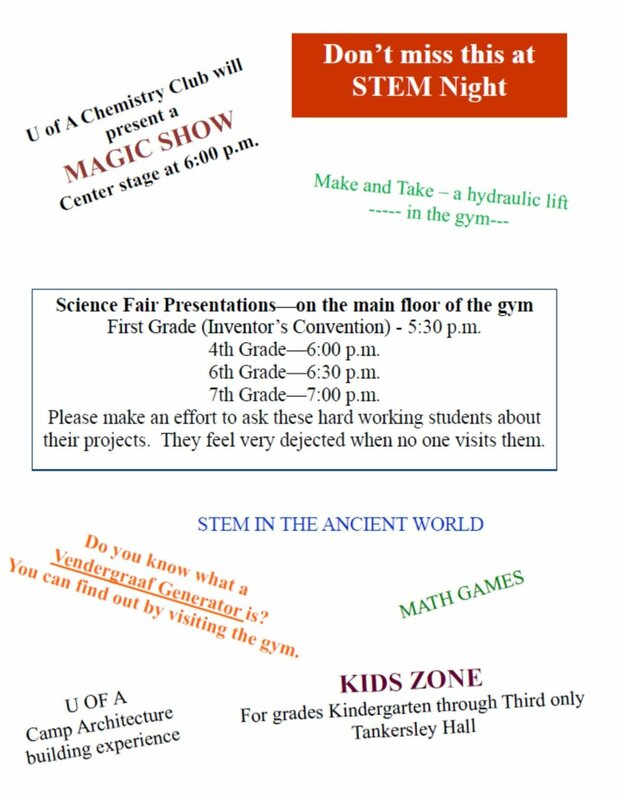 Science Project Presentations – the Fourth, Sixth, and Eighth graders will present their projects at 6:00 p.m., 6:30 p.m., and 7:00 p.m. respectively. Please make it a priority to ask them about their projects. It is very disappointing to stand there for twenty minutes and not have any audience! First Grade Inventors Convention – First graders have researched various inventors and will be sharing their findings at 5:30 p.m.
Kids’ Zone – activities especially geared to grades Kindergarten through Third, including a musical instrument maker space and microscopic investigations. Door Prizes – available to those who engage in the activities provided. As you can see, this is a BIG event. Come and be part of it. You will be amazed!